Automaze, a self-cleaning automatic air filter, provides the best in impingement-type air cleaning, with a minimum of servicing. A traveling curtain of highly efficient, permanent, all-metal filter panels presents a double filter barrier to dust-laden incoming air. 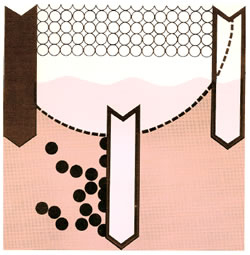 Airborne particles are trapped on the adhesive-coated filter media (see Fig. 1). The panels travel down the back of the filter housing and are submerged in an oil-filled sump. Here they are washed free of collected dirt and are simultaneously recharged with an adhesive coating. The panel then continues up the front of the housing where they present the same face to the moving air stream. Automaze is constructed of heavy gage steel and is ruggedly braced throughout. A self-contained individual drive is furnished with each filter section. The drive consists of a 1/25-hp motor, connected through a speed reducer and pinion-gear arrangement to a chain drive sprocket. This moves the endless roller chain on which the filter panels are suspended. The drive rotates at about 0.15 rpm at the chain sprocket. Normally, the control system permits the drive to move the filter panels through a complete washing cycle at either of two present rates: once every 24 hours or once every 12 hours, determined by a toggle switch setting on the control box. Special cycles of operation may be obtained if required by replacing the timing motor cams with special cams. Figure 1. Selected wire screen meshes form a progressively denser media to provide higher efficiency and to increase dirt handling capacity. Based on AFI test procedures, Automaze provides efficiencies ranging from 78% to 85% at a rated net air velocity of 505 FPM. This high rate of efficiency is constantly maintained by the continuous self-cleaning action. Resistance through clean panels is .3” WG. One or more filter sections, with all filter panels installed. 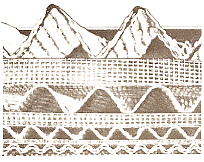 A plenum section and/or louver section(s) where required, and specified. Extra panel snap rings, sump sludge scraper, and bolts for fastening together filter section. Sufficient adhesive for an initial filling. After carefully uncrating, move Automaze filter section(s) into final installation position. The filter sections must rest on a level floor or a foundation base capable of supporting the entire weight of the installed unit. Holes are provided in the bottom plate of each section to permit secure attachment to the floor or foundation. Holes are also provided in the top and side plates of each section to facilitate installation of duct work. All duct work seams and connection on the clean air side would be sealed. And it is suggested that an access door be location in the front and rear of the filter to permit servicing. Allow a minimum of 3’ servicing space. Detailed instructions covering electrical connections are furnished at time of shipment. The sections of a multiple section assembly should be connected in series. After all the assembly and connections have been completed, fill the oil tanks of each filter section to the level mark found inside the tank. Start the filter by closing the 15-amp safety switch (supplied by the electrical contractor) and then the toggle switch located on the cover of the control box. CAUTION: The filter should be operated for 24 hours before the blower is turned on. Observe to see if the filter curtain moves periodically—at least once every 10 minutes. It is recommended that the filter be wired to permit it to operate independently of the fan. This practice will maintain properly conditioned filter panels. This assures maximum filtering efficiency and minimum airflow resistance. The oil level in the sump should be maintained near the “full” mark at all times. Average adhesive consumption during a year’s operation is estimated at 10% of the total capacity of the filter. At regular intervals, remove the accumulated sludge from the sump. A scraper is furnished for this purpose. Replace any oil lost during the procedure…If it becomes necessary to remove any or all of the panels, be sure to first turn the unit OFF. To remove the panels, unbolt the two plates on the front of the guide channels. Then remove the wire snap rigs from the support pins. Slip the panel support pin from the conveyor chain lugs and remove the panel. Rotate the curtain manually to allow removal of additional panels. Should it become necessary to replace the safety shear pin, remove a panel as indicated above. Loosen the ¼-20 socket head set screw which secures the pin (this is located in the drive sprocket hub). Remove the broken pin from the drive sprocket and the adjacent collar. Align the shear pin hole in the drive sprocket and collar by manually moving the filter curtain which in turn will rotate the collar. To accomplish this, simply lift up on the front face of the curtain. Insert and secure the new shear pin and replace the panel. Available accessories include weather louvers, plenum chambers, and immersion heaters. Contact factory for details.